Yesterday’s ride took me down the hill, around the harbor, and back up through Federal Hill for a cheap haircut and a morning with my favorite fresh baby and her mom. It was a windy ride there and back, gusts that blew me of my course and went straight through my windproof gloves. I had the wind at my back when I was riding down the hill, a fact I realised only on my way back up. I didn’t head back out again until the evening, when I layered up and strapped on all the lights to zip over to the Humanim building on the east side. I’ve passed that building by accident a bunch of times and always wondered why a castle rises over the blighted blocks of this neighborhood. Turns out it’s because Humanim decided to find the 25 million bucks to renovate it and turn out into a workforce development and community organizing force for the area. This night it was for a meeting of Baltimore Corps, and I was there to task about why local history matters. The Humanim rep said it mattered because it matters. I said it mattered because politics and justice and how are for here and how we could be elsewhere and all sorts of reasons. And then I was done and left to roam the building. 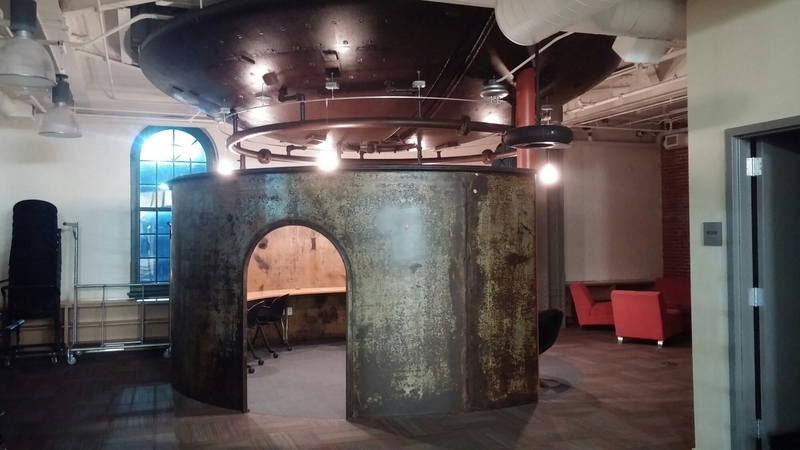 I headed straight to the second floor to see how they’d repurposed the giant pressure cooker of this old brewery–it’s another workstation, a magical one. Sometimes history matters because look at this place. And then I got back on my bike for a windy ride home, happy to be back in action after a long winter’s nap.